Stuffed animals are the delight of almost every little kid. They take these toys everywhere and do virtually everything with them. Occasionally, these stuffed animals are dropped in dirt, peed on and accumulate dust over a period of time. Cleaning these toys are essential as kids stuff them in their mouth sometimes without caring if they are dirty or not. Do you have a stuffed toy that needs cleaning? There are two hassle-free and easy ways to wash your kid’s stuffed toy. Before you begin, ensure you read the washing instructions on the toys you intend washing. While some toys are suitable for machine wash, others aren’t meant to be washed at all. Start by sewing up any loose rips on the toys. Secure bows and ribbons with extra stitches before you begin. This will prevent loss of stuffing from the toys. Place the toy into a mesh washing bag or a pillowcase to prevent it from snagging during the wash.
Lay the toy in the washing bag inside the washing machine, add the mild detergent and set the washing machine on cool. Use a gentle/delicate washing cycle to wash the toy. After the wash is complete, air dry the toy outside till it is completely moisture free. If you do not have access to a washing machine, you can still have your stuffed toys cleaned and fresh by washing them the good old way. Just like when washing pillows by hand, make sure you use a very mild laundry detergent. Ensure all rips are stitched before beginning the wash process. Fill up a bucket or the kitchen sink with cold water. Add a small amount of mild detergent and immerse the toy in the soapy water mixture. Once the dirt is out, rinse out any leftover soap residue using enough water. Squeeze out all excess water by pressing the stuffed toy between old clothes or towels. After getting out the water, fluff the toy into its original shape and hang out to air dry. Cleaning plush toys which come with batteries require special procedures as you can’t simply toss them in the washing machine. Before you begin washing, it is important you remove the batteries in the plush toys to minimize damage to the toy. In cases where the entire battery compartment can be removed from the plus toy, do well to remove it too. Fill a bowl with clean cool water, baking soda and add little quantity of mild detergent. Use the washcloth to get rid of stains in the toy just like you would do when you clean upholstery, by dipping it in the soapy mixture and scrubbing the toy. Rinse excess soap by using a clean piece of clothing dipped in cool plain water. Continue cleaning with the cloth dipped in plain water till there’s no soap residue left. Air dry the toy to remove all moisture. Sprinkle a generous amount of baking soda all over the toy. Allow it to sit for some days and vacuum over the excess baking soda later with a vacuum cleaner. Once in a while, it is important to disinfect your child’s stuffed animals especially when they have had the flu. This will prevent recontamination and spread of germs. Add a few drops of household bleach to a gallon of water in a bowl. Dip a cloth or brush into the bleach mixture and use to scrub the exterior of the stuffed toy. The bleach in the mixture will kill any germs on the toy. Rinse the toy by scrubbing with cool plain water. Air dry outside to get rid of moisture. 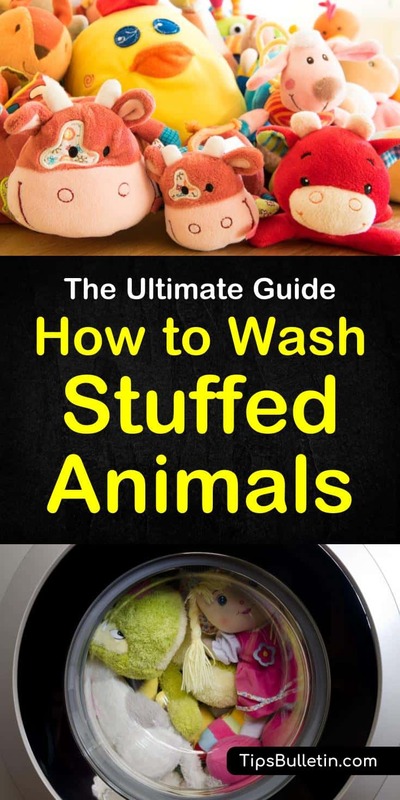 If you found these cleaning tips for stuffed animals and plush toys useful, please share this article on social media with your friends and family.